Watkins Spices and Rack | Just The Right Spice! Watkins spices and spice rack are sure to compliment nearly any kitchen decor. 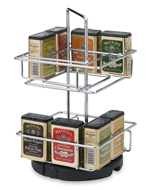 The custom chrome plated wire rack holds 16 decorative, vintage look tins filled with your favorite Watkins organic herbs and spices, which are sold separately. The compact, easy to clean design fits neatly inside your cupboard or on your counter top. You’ll find the convenient turn table base spins easily and the handle makes it a dream to move around your work space. The Spice Rack (00515) filled with herbs and spices will make the perfect gift for a new bride, house warming, Christmas, birthday, graduation or for yourself! You’ll find them all in the US catalog or the Canadian catalog. I can’t find this spice rack on the Canadian or US site. Any suggestions on where to look? I would like to purchase this spice rack and 16 tins. How do I go about doing that?